Do you have your key ready? The Gringotts Bank expansion at Warner Bros Studios Tour London is about to officially open to the public on April 6th, 2019. To celebrate the occasion, Radio 1 DJ and TV presenter Matt Edmondson hosted the sneak preview on the Warner Bros Studio Tour London social media channels. The presenter met up with guests invited to the event, interviewing stars from Harry Potter and Fantastic Beasts. Jason Isaacs (Lucius Malfoy), Claudia Kim (Nagini) and Dan Fogler (Jacob Kowalski) were on hand to talk about their experiences while exploring the new expansion and what they would hide in one of Gringotts's vaults. The Gringotts Bank expansion is the biggest addition made to The Making of Harry Potter: Warner Bros Studios Tour London. The bank spans 16,500 square feet, and was designed by many of the original crew members from the Harry Potter films including Production Designer Stuart Craig, Construction Manager Paul Hayes, and Head Propmaker Pierre Bohanna. Special Effects Supervisor John Richardson promised that there's more than what meets the eye at Gringotts Bank. Be on the lookout for special surprises and new details when you visit. Make-Up and Prosthetic Specialist Sarita Allison shared her memories of working on the movie set and how they were brought to life for the latest tour. Harry Potter fan site and forum SnitchSneeker also attended the event giving fans another look at the expansion with the tour's new Chocolate Frog inspired cafe and the initial entrance to the Gringotts Bank. Spotted the new Chocolate Frog and Gringotts-inspired entrance to @wbtourlondon during our preview of the Wizarding Bank expansion, opening this weekend. 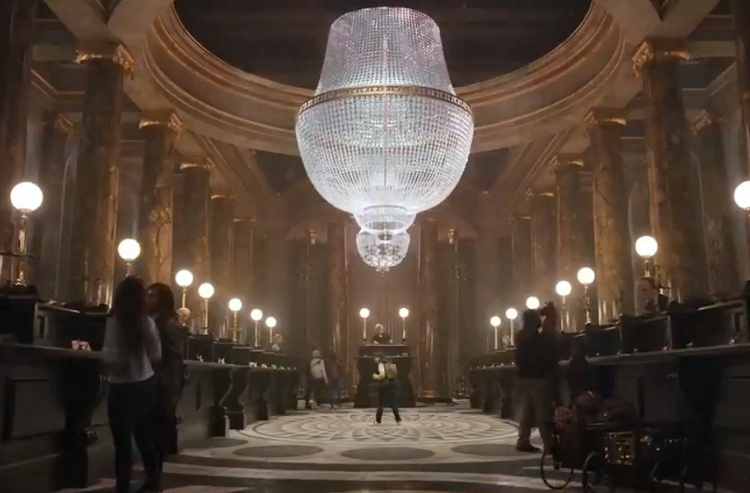 While we have been hearing that the expansion will include the Gringotts Bank lobby and Bellatrix Lestrange's vault, Warner Bros Studios Tour London also revealed a BIG secret they've been keeping. You might not want to watch the video below if you're want to see the expansion spoiler-free! I will things are heating up. It's something to see to believe! The Gringotts Wizarding Bank expansion will officially open on Saturday, April 6th. Make sure you have your wand and key ready for inspection! Plan your magical visit and check out all the latest information at Warner Bros Studio Tour London - The Making of Harry Potter official website.